Non-Specific and Non-Immediate: [On the annual review six months later]: Jim doesn’t do very well presenting in front of executives. He takes a while before he gets to the point. Jim’s work often caused me re-work. Sadly, it is structurally built in to many organizations that managers provide un-artful performance feedback. And managers — via this dynamic — receive a lot of weird looks — or worse — from their employees when they are the recipients of un-artful feedback. 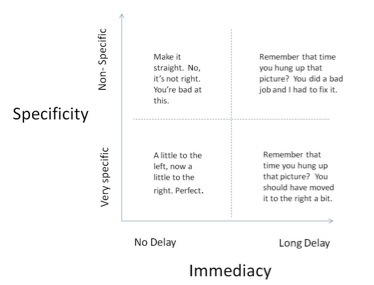 So for all of you managers out there: Attempt to increase the specificity and immediacy of feedback. Focus on the behaviors you would like to see, and don’t hesitate to make corrections. And if the feedback isn’t specific and immediate, then you risk creating more harm than good. And don’t wait until the performance review to provide feedback. Better to drop it entirely! For all of you aspiring management designers out there: Is your current management design aimed at increasing or decreasing the specificity and immediacy that performance feedback is given? What are you doing to make sure managers are encouraged and enabled to give specific and immediate feedback? Is anyone helping the manager in improving in this art? Is your current management design such that managers are encouraged and rewarded in providing almost exclusively non-specific and non-immediate feedback? And what is done to make sure this toxic delayed and vague feedback does not surface on the annual performance review? Have you ever given non-specific and non-immediate feedback? What happened? Are you encouraged to give feedback to your employees? What examples do you have examples of successfully providing feedback and correcting behavior? How specific and immediate was it? The Manager by Design blog provides twice-weekly people management tips and discussion on the emerging field of Management Design. If you are looking for ideas on how to be a better manager of people and teams, subscribe to Manager by Design by Email or RSS. A fellow educator and I were discussing the blog and the importance of specific and immediate feedback in education. He related a very memorable demonstration during a teacher training session he attended years ago. One teacher trainee was asked to sit with his back to a waste basket which was positioned after he sat down. He was then to asked to crunch sheets of paper into ball and toss them into the waste basket that was somewhere behind him. Without specific and immediate feedback, he was unable to hit the basket. When a second trainee stood in front of him and provided specific and immediate feedback–‘that was short and too far to the right’–he was able to hit the basket. Specific and immediate feedback is the most important step in the learning process.